Peat, considered to be a precursor of coal. It has industrial importance as a fuel in some countries, for example, Ireland and Finland. Lignite, also referred to as brown coal, is the lowest rank of coal and used almost exclusively as fuel for steam-electric power generation. Jet is a compact form of lignite that is sometimes polished and has been used as an ornamental stone since the Iron Age. Sub-bituminous coal, whose properties range from those of lignite to those of bituminous coal and are used primarily as fuel for steam-electric power generation. Bituminous coal, a dense coal, usually black, sometimes dark brown, often with well-defined bands of bright and dull material, used primarily as fuel in steam-electric power generation, with substantial quantities also used for heat and power applications in manufacturing and to make coke. 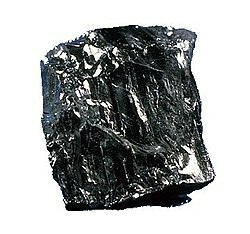 Anthracite, the highest rank; a harder, glossy, black coal used primarily for residential and commercial space heating. Graphite, technically the highest rank, but difficult to ignite and is not so commonly used as fuel: it is mostly used in pencils and, when powdered, as a lubricant. The middle six grades in the table represent a progressive transition from the English-language sub-bituminous to bituminous coal, while the last class is an approximate equivalent to anthracite, but more inclusive (the U.S. anthracite has < 8% volatiles). See also: Underground Coal Gasification. Intensive research and project developments have been implemented from 2001. The World CTL Award is granted to personalities having brought eminent contribution to the understanding and development of Coal liquefaction. The 2008 presentation ceremony took place at the World CTL 2008 Conference (3 & 4 April, 2008). There are a number of adverse environmental effects of coal mining and burning. rendering land unfit for other uses. coal-fired power plants without effective fly ash capture are one of the largest sources of human-caused background radiation exposure. where 1 mol is equal to NA (Avogadro Number) particles. This can be used to put a carbon-cost of energy on the use of coal power. Since the useful energy output of coal is about 30% of the 6.67 kW·h/kg(coal), we can say about 2 kW·h/kg(coal) of energy is produced. Since 1 kg coal roughly translates as 1.83 kg of CO2, we can say that using electricity from coal produces CO2 at a rate of about 0.915 kg/(kW·h), or about 0.254 kg/MJ. British Petroleum, in its annual report 2007, estimated at 2006 end, there were 909,064 million tons of proven coal reserves worldwide, or 147 years reserves to production ratio. This figure only includes reserves classified as "proven"; exploration drilling programs by mining companies, particularly in under-explored areas, are continually providing new reserves. In many cases, companies are aware of coal deposits that have not been sufficiently drilled to qualify as "proven". However, some nations haven't updated their information and assume reserves remain at the same levels even with withdrawals. For 2005 as the official energy statistics of the US Government. ^ a b Britannica 2004: Coal mining: ancient use of outcropping coal. ^ Salway, Peter (2001): A History of Roman Britain. Oxford University Press. ^ Forbes, R J (1966): Studies in Ancient Technology. Brill Academic Publishers, Boston. ^ Balancing economics and environmental friendliness - the challenge for supercritical coal-fired power plants with highest steam parameters in the future (PDF). Retrieved on 2006-10-23. ^ Cleaner Coal Technology Programme (October 1999). "Technology Status Report 010: Coal Liquefaction". Department of Trade and Industry (UK). Retrieved on November 23. ^ Phillip A. Lowe, Wilburn C. Schroeder, Anthony L. Liccardi (1976). "Technical Economies, Synfuels and Coal Energy Symposium, Solid-Phase Catalytic Coal Liquefaction Process". The American Society of Mechanical Engineers. ^ Diesel Fuel News: Ultra-clean fuels from coal liquefaction: China about to launch big projects - Brief Article. Retrieved on September 9, 2005. ^ Welcome to Coal People Magazine. Retrieved on September 9, 2005. ^ NYMEX.com: Coal. Retrieved on January 16, 2008. ^ ICE: Coal Futures. Retrieved on January 16, 2008. ^ Fisher, Juliya (2003). Energy Density of Coal. The Physics Factbook. Retrieved on 2006-08-25. How much coal is required to run a 100-watt light bulb 24 hours a day for a year?. Howstuffworks. Retrieved on 2006-08-25. ^ Sino German Coal fire project. Retrieved on September 9, 2005. ^ Committee on Resources-Index. Retrieved on September 9, 2005. ^ http://www.fire.blm.gov/textdocuments/6-27-03.pdf. Retrieved on September 9, 2005. ^ EHP 110-5, 2002: Forum. Retrieved on September 9, 2005. ^ Overview about ITC's activities in China. Retrieved on September 9, 2005. ^ Burning Mountain Nature Reserve. Retrieved on September 9, 2005. ^ North Dakota's Clinker. Retrieved on September 9, 2005. ^ BLM-Environmental Education- The High Plains. Retrieved on September 9, 2005. ^ http://www.wsgs.uwyo.edu/Coal/CR01-1.pdf. Retrieved on September 9, 2005. ^ International Energy Annual 2005: Reserves. Retrieved on March 22, 2008. ^ a b BP Statistical review of world energy June 2007 (XLS). British Petroleum (June 2007). Retrieved on 2007-10-22. (2005) The Face of Decline: The Pennsylvania Anthracite Region in the Twentieth Century. Cornell University Press. ISBN 0-8014-8473-1. Long, Priscilla (1991). Where the Sun Never Shines: A History of America's Bloody Coal Industry. New York, NY: Paragon House. ISBN 1557784655. Rottenberg, Dan (2003). In the Kingdom of Coal; An American Family and the Rock That Changed the World. Routledge. ISBN 0-415-93522-9. Robert H. Williams and Eric D. Larson (December 2003). "A comparison of direct and indirect liquefaction technologies for making fluid fuels from coal" (PDF). Energy for Sustainable Development VII: 103-129. Outwater, Alice (1996). Water: A Natural History. New York, NY: Basic Books. ISBN 0-465-03780-1. Smith, Duane A. (May 1993). Mining America: The Industry and the Environment, 1800-1980 (in English). Lawrence, KS: University Press of Kansas, 210. ISBN 0870813064. Coal is a combustible fl or brownish-fl sedimentary rock composed mostly of carbon and hydrocarbons. Coal is baked in hot furnaces to make coke, which is used to smelt iron ore into iron needed for making steel. Coal (previously referred to as pitcoal or seacoal) is a fossil fuel extracted from the ground by underground mining or open-pit mining (surface mining). Coal composition is determined by specific coal assay techniques, and is performed to quantify the physical, chemical and mechanical behaviour of the coal, including whether it is a good candidate for coking coal. Coal liquefaction is one of the backstop technologies that will limit escalation of oil prices and mitigate the alleged effects of peak oil, provided that the extra carbon dioxide released in the process does not catastrophically accelerate global warming/adverse climate effects.